Happy Super Bowl Sunday! To celebrate this year's socialist sports spectacular, I'm sharing John Oliver videos for the third day in a row. * Yes, Last Week Tonight has several videos on football and other pro sports. I begin with one from four years ago, Workplace of the Week - The NFL: Last Week Tonight with John Oliver (HBO). 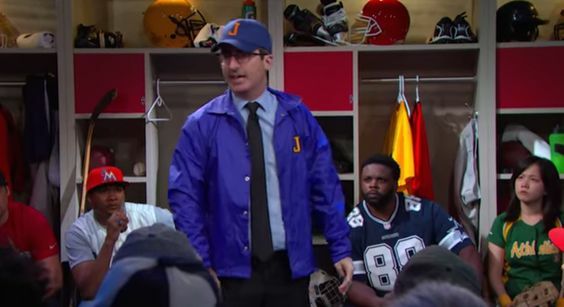 Last Week Tonight explores the exciting world of the NFL! It's a great place for mascots to work. Not so much for cheerleaders. That was just the warmup act. Here is the main event, Stadiums: Last Week Tonight with John Oliver (HBO). When I called the Super Bowl a "socialist sports spectacular," I wasn't just referring to the NFL's compensation for its member teams. I was also referring to the financing of its stadiums. It's all enough to drive one to drink, so here are Superbowl Shots Eagles vs Patriots in case one succumbs to the urge. It wouldn't be a Super Bowl post of mine without a video from Tipsy Bartender. *I'm planning on posting another on D.C. Statehood tomorrow, as a follow-up to Vox on Puerto Rico statehood and John Oliver on territories. Stay tuned.